I started piano at 5 and was taught for the first year by my mother. I then had 6 years of classroom piano in public school with Mr. Ewel Oler at Dan D. Rogers Elementary in Dallas. In the 7th grade, I started on the baritone and continued into the 8th grade at Ben Franklin Jr. High. There were too many baritones and no French Horns so our director Mr. Russell Williams, had me try to play the horn. It took a while but I began to enjoy the instrument during concert season. In 9th grade, I teamed up with 4 other brass players for contest and we won Best in City for Jr. Highs. The quintet played with the other solo and ensemble winners on a TV show on Channel 13. 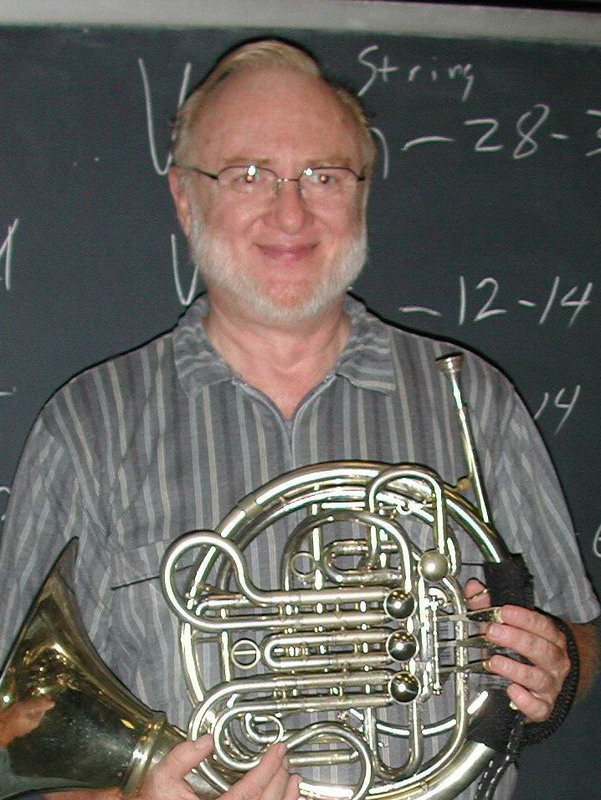 I continued the horn through Hillcrest High School and in my senior year (1967), I took private lessons with Dr. Alfred Resch. I was part of a horn quartet that Dr. Resch put together for solo and ensemble that year and we won Best Ensemble in City. I also was 3rd horn in the All City Orchestra as a senior. I continued taking lessons through my freshman year at SMU where I was a Chemistry major. My second year in college was at North Texas in Denton but due to the labs, etc., I did not have time for music and stopped playing. I left North Texas without a degree but with a lovely wife and we began our family. I returned to night school and finally graduated in 1985 from UTD with a degree in Mathematics. My mother and dad were playing with Town North and they talked me into picking up the horn and trying to play again (after 11 years!). They were so sweet to pay for having the valves and slides worked on and the dents knocked out of the old Buscher I had played earlier. Except for a small sabbatical, I have played with Town North ever since then. I also played with the Mesquite Symphony, Bravura Wind Ensemble, Hallelujah Brass Quintet and am currently a member of the Noble Brass. In addition to the French Horn, I also play Tenor Horn for the Frohsinn Kapella German Band. I toured Austria and Germany with this group in 2000. I also play Eb Alto Horn (small Baritone) for the Heritage Brass Band, a Civil War reenactment group. All the people I have had the pleasure of knowing through the various musical groups have been wonderful companions and the joy of making music together is something I could never replace. I hope to play horn for a long time to come.